Screened porches are useful, but they fell out of favor with designers for awhile. Lately, screened porches (or three-season rooms) are making a comeback. Articles in news outlets are talking about how builders are using fresh ideas for this outdoor living space. Screening your front or back porch or patio is a useful way to get more out of that space. But why are screened porches suddenly coming into style? Here are some of the reasons we’re building more Screeneze® porches. Zika is still out there. Last summer Zika hit the news in a major way. While we haven’t heard as much about it this spring, mosquitoes are still carrying this virus. Escaping from mosquitoes is always nice, but now it’s even more important for your health. Screened porches are more than just a porch. The term “three-season room” is more apt nowadays; people are turning their outdoor living spaces into another room to live in. Screened porches contain sets of comfortable furniture, rugs, ceiling fans, and fireplaces. Manufacturers are stepping up, creating durable, high-quality furniture for these spaces. Screens provide some privacy. If your yard isn’t three acres, you might feel exposed to neighbors sitting your front or even your back porch. Different types of screens can help block you from neighbors and passing cars, even at night. Easy to install. Whether you already have a porch or deck in place or not, creating a three-season room is much easier than building an entire addition onto your home. 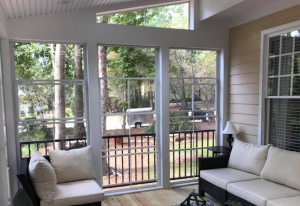 A screened porch is a nice option if you’re seeking some extra living space you can use most of the year that doesn’t break the bank. Building a screened porch or patio requires some planning, such as size, where the door will go, electrical outlets, ceiling fans and roofing needs. We’re happy to help you through the design process. Here are some useful tips to get you brainstorming about your porch project. Ready for your screened porch? Contact us for more information.